Khloe Kardashian isn't impressed with her family's softball skills. In this clip from Sunday's all-new Keeping Up With the Kardashians, Kris Jenner and Kim Kardashian practice for an upcoming softball game as the pregnant Good American founder coaches from the sideline. "Is this the mound?" a confused Kim asks Khloe. "No, the mound is there," the Revenge Body host explains. "That would be the pitcher's mound." Unfortunately, the KKW Beauty boss is still thoroughly confused as she mixes up the locations of first base and home base. After advising Kris to get on the pitcher's mound, Khloe watches as Kim tries and fails at hitting some balls. "The first softball practice is terrifying," Khloe admits in a confessional. "It's just chickens with their head cut off running around this field. It's not good." 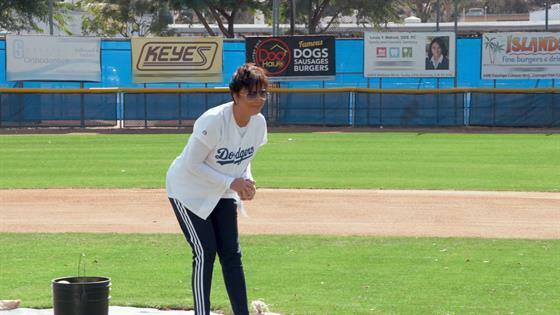 Things only get worse when Kanye West's wife tries her hand at pitching. Not only does the mother of three knock the momager off her feet, but Kris is left with a hurt wrist too. "Oh my god, are you okay?" Kim asks as she rushes to her mother's side. "Oh my god, did you hurt your wrist?" "I did," the Kardashian-Jenner matriarch responds while holding her hand. Understandably, this incident has left Khloe wondering if Kim was "aiming" for Kris' head. Will the Kardashian-Jenners be able to pull it together before the big game?